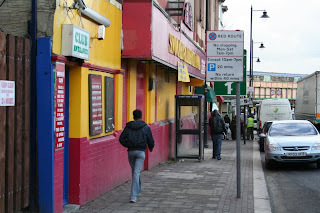 This is quite a vibrant place located in Wood Green North London. Was notorious for crime, and has recently seen a massive influx of Eastern European immigrants into the area. The boxes are usually used by them in the late evenings to call home (I guess). But you'll get someone almost always waiting in this area. Commuters arrive up from the escalator on the right and come trough the ticket barriers in the shot to leave the station. At a quite time you definitely be able to get the attention of the barrier operators featured in the shot. Both of whom I know and have worked here for a long time. 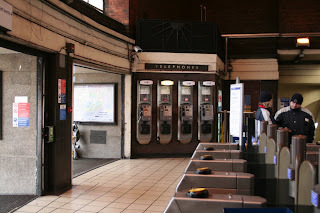 Since this photo was taken the two payphones to the left have been removed, the numbers listed here are for the two remaining on the right. A real urban payphone here. Doubt it gets much use (well not for phone calls), smelt of urine and was damaged quite bad. It does however ring very loud when called. It is also the scene of quite a lot of bother. Can at some point in the day find a police car or ambulance here attending to something or another. The building it's against is the local snooker hall and the bridge ahead is Bruce Grove train station the serves Liverpool Street Station.